These cookies are really, really great. No, really — they’re the kind that make people’s eyes pop out a little. Then the person revises their obligatory “thanks for the cookie” compliment and sends you several emails telling you that these REALLY are the best cookies they’ve ever had. And yeah, I omit the Jack-O-Lantern face. These taste more like ThanksChristmasGiving-style cookies anyhow. Source: Alison Ladman, AP, reprinted in the SLO Tribune. Molasses and spice make for great autumnal flavors. 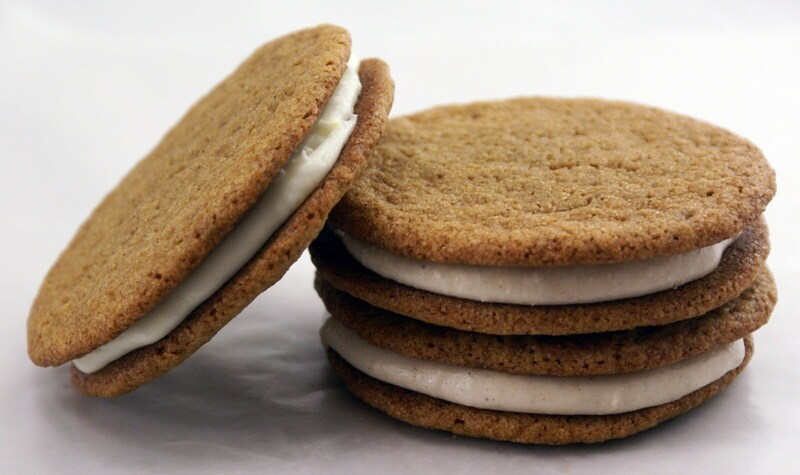 In this cookie sandwich we’ve taken a chewy gingerbread pumpkin cut-out cookie and added fun jack-o-lantern faces and a lightly sweetened cream cheese filling. For another fall theme, the cookies also could be made with leaf-shaped cutters. If your dough gets too warm, put it in the freezer for 5 minutes for easier cutting. A thin metal spatula works well for transferring the unbaked cookies to the prepared baking sheet. To make the cookies, in a medium bowl, whisk together the flour, cinnamon, ginger, cloves, allspice, salt and baking soda. In another bowl, use an electric mixer beat together the butter and brown sugar. Mix in the molasses and milk, then the dry ingredients. Refrigerate until firm, about 2 hours. When ready to bake, heat the oven to 350 F. Lightly coat 2 baking sheets with cooking spray or line with parchment paper. On a lightly floured surface, and working with half the dough at a time, roll out the dough to 1/8 inch thick. Use a 4-inch pumpkin-shaped cookie cutter* (and rerolling scraps as needed) cut out a total of 40 cookies. Use a paring knife or very small cutters to cut out a jack-o-lantern face on 20 of the cookies. Transfer the cookies to the prepared baking sheets, leaving 1 inch between each cookie. Bake for 12 to 15 minutes, or until golden around the edges. Transfer the cookies to a rack and allow to cool. To make the filling, in a medium bowl use an electric mixer to beat together the cream cheese, sugar and vanilla until smooth and creamy. Add a tablespoon of filling to the bottom cookies (without faces) and spread to within a 1/4 inch of the edges. Place a top cookie on each to create a sandwich. Store in an airtight container in the refrigerator between layers of waxed paper or parchment. Use parchment paper for these unless your cookie sheets are the TRULY top-notch nonstick type that make every normal cookie spread superflat and embrace the sheet with ever possible inch of its surface. Instead of cream cheese, I use either neufchatel / lowfat cream cheese, or one package of cream cheese plus 1/2 stick butter (either way, the frosting is less thick and heavy-feeling; the butter option is very soft, and the neufchatel option is soft-ish but holds up a little better if you can’t refrigerate the cookies after making them sandwiches). If you’re not going for the real-cream-cheese option, cut back on the sugar and vanilla in the filling by as much as 1/4. Cut back the cloves to as little as 1/4 tsp if anyone’s got a sensitive stomach. These need to stay cold while you roll out each bit of dough, so after mixing the dough I cut it into quarters, freeze it for 1/2 to 1 hour, then pull out one quarter to roll, move the rest to the fridge, and repeat. Because the filling dampens things up a bit, these are better slightly overdone — just a little blush of molasses-dark on the bottoms. *These are much better as SMALL cookies since you’re doubling them, so instead of the massive standard cookie cutter they recommend here, I use a shot glass to cut them out. A normal-size cutter makes these WAY too big. I’ve never done them quite oreo-small, but that size probably would be ideal to keep the risk of sugar-shock aneurism to a minimum.